We love shopping online but we do not like having to pay shipping fees. We bet you feel the same way. You and your dog can be happy shopping on Five Barking Dogs! 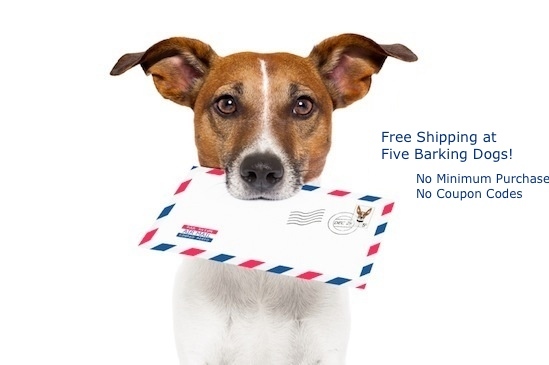 because we offer free shipping on all our dog products. Best of all just buy what you need or want. No hidden surprises, no coupons, and no minimums required. We pay for your shipping. You won't have to wait weeks for your order to arrive either. Orders usually ship priority if possible. If an order ships from the manufacturer, it may take a few days longer but it is still free shipping. How can we do this? It isn't easy but we think it is worth it. We do not markup our products to cover shipping or add handling fees. We pay for the shipping out of our pocket. Why do we do this? Because we love shopping online but we do not like having to pay shipping fees. We'd rather spend the money on our dogs. We bet you feel the same way. Make sure to tell your friends too - because everyone loves free shipping!